Our DetoxVeda At Home Pancha Karma-Group Cleanse is designed to loosen and eliminate toxins (ama), imbalances, and cellular memory from the mind/body. The benefits will be felt in the body, mind, and the emotions. An easy cleanse you can do at home! In order to become healthy, or to maintain the good health that you may have, it is important to cleanse on a regular basis. It is best to have a cleanse that is effective, yet gentle and not harsh. At our Clinic, we have found that our patients enjoy having a support system as they go through their cleanse. It gives a certain type of group enthusiasm and commitment. Everyone who is signed up for the cleanse will receive the benefit of Dr. Cravatta’s healing energy and the effect of group consciousness that enhances each persons experience. Our group cleanse is designed for everyone to benefit. We offer several options so that it can be customized for your particular concerns and needs. 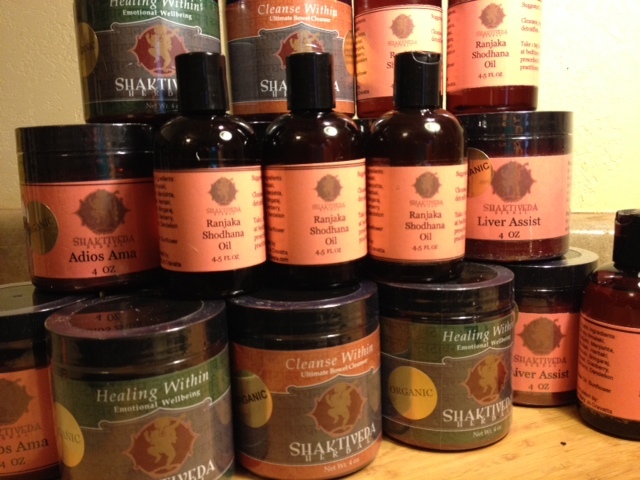 We will be offering our Shaktiveda Group Cleanse 3 times per year – January, May, and September. Part 1 will begin Sunday, September 16, 2018. It is an at home Pancha Karma type of cleanse, Ranjaka Shodhana (Liver Cleansing), that uses herbalized oil to loosen and release toxins and imbalances from your Liver – both physically and emotionally. We are now offering the option to add a liver flush aspect to our Liver Cleanse. Dr. Cravatta believes that it is important to not only have a healthy liver to create balance, but also to have balance within our hormones – thyroid and reproductive. During her informative cleanse conference calls, she places an emphasis on sharing information on these and other topics to assist you in creating health and well being within your life. Part 2 will begin on September 30, 2018 with our Premier Detox Veda Cleansing Program designed to release toxins, excess weight, and cellulite! It uses both internal and external herbal support including our wonderful Detox Veda Herbal Body Wrap. You need to experience it to truly appreciate the effectiveness of this herbal wrap. We call this 2 week cleanse the “14 Day Turn Around” – and you will see why once you have finished and see the amazing results! You may choose to do either Part 1 or Part 2 – and for those that want to make a significant difference, you may choose to do both Part 1 & Part 2. Both Part 1 and Part 2 will include Conference Calls at the beginning, middle and finish of your 2 week Cleanse. In these calls, Dr. Cravatta will share invaluable knowledge and you will be able to ask questions. To add to your understanding and effectiveness of the cleanse, we have three instructional videos for you to watch. In addition, we will have a FaceBook Group Page for your Cleanse, so that you may ask questions, give comments, or just chat with fellow Group Cleansers. One of the Shakitveda Staff Members will be monitoring your questions so that you will have the support that you need. If during your cleanse you feel the need for additional support, you may desire to have a special consult with one of our Staff Members at a minimal charge. You will begin the process with a phone appointment with a Shaktiveda Ayurveda Staff member. Our highly trained staff will assist you in deciding how to individualize your cleanse with herbal support. Once you have decided, you will be sent the necessary herbal products. We are very please to be offering you this in depth mind / body cleanse. Many cleanses just focus on a physical cleanse. With our Shakti Infused Herbal Products and our Awaken Within Yoga DVD we are able to assist you in addressing old mental or emotional imbalances along with physical toxins. Both Part 1 and Part 2 of our Shaktiveda Group Cleanse is designed to be done for 2 weeks – which will allow you to release and renew so that you will begin feeling more balanced and more in touch with your bodily and emotional needs. During your Cleanse, you may continue with a somewhat regular routine as you do your at home cleansing. A specific diet is recommended for these days. If you have chosen to join us for both Parts, then your cleansing experience will be for 28 days. If you have a particular health concern, you may also choose to have a consultation with Dr. Cravatta in addition to your pre-cleanse phone consult with the Shaktiveda Staff Member. View our refund policy. Watch the Introductory Video on our Group Cleanse. Signing up is easy! You may pay for Part 1, our Liver Cleanse, on our website: http://shaktiveda.com/product/group-liver-cleanse/. Or, you may call our Clinic: 530-273-8716. It is best that you sign up at least 2 – 3 weeks before the cleanse begins – as it gives you time to have your pre-cleanse phone consult and receive your herbal products. If you decide to do our liver flush option, we will have you take Liver Assist and Guggulu to begin the process of melting the liver / gall stones (which most people have). The sooner you begin this process, the better. Kit contains: Cleanse Within Colon Cleanser capsules, Adios Ama capsules to eliminate toxins & excess weight, Mind Formula capsules(options are 1 of either: Calm Within to release mental & body stress, Healing Within to release cellular memory, or Soothing Pitta Magic to ease Pitta & fiery emotions), 4.5 fl oz Herbal Ranjaka Shodhana Oil to cleanse the Liver, and the Awaken Within Yoga DVD. Optional Part 1 Cleanse Products to be paid for separately: If you already have our Awaken Within Yoga DVD or other products for the cleanse, you may just buy what you need and not purchase the Cleanse Product Kit. Most cleansers actually prefer to get our 4 oz powdered herbal formulas as they may desire to continue on with the herbs after the cleanse. If you plan on doing a liver flush you will need: Liver Assist herbal formula, Guggulu capsules,. You may also desire to purchase: Iodine Supplement, Liver Rasayana, Various Vitamin Supplements. These will be discussed during the cleanse. Kit contains: 8 oz Detox Veda Bath Soak to loosen & release toxins, cellulite, & excess weight, 4 oz Detox Veda Scrub for exfoliating & release toxins, cellulite, & excess weight, Cleanse Within Colon Cleanser capsules, Adios Ama capsules to eliminate toxins & excess weight, Mind Formula capsules (options are 1 of either: Calm Within to release mental & body stress, Healing Within to release cellular memory, Clarity Within capules or Soothing Pitta Magic to ease Pitta & fiery emotions), and the Awaken Within Yoga DVD. Our Cleansers are so enthusiastic about the results that they receive, that many will return to cleanse with us again and again. With each time of joining our cleanse, the mind / body effects go deeper and deeper. “LOVING the cleanse, love the way I look and feel! What a successful program you have created!!!!!! I will do this again for SURE!!!!! Sending you immense amounts of love and adulation!